Stand Up Paddle Surfing: Ripping at La Jolla Shores- Alexis Rovira gets the shot. Ripping at La Jolla Shores- Alexis Rovira gets the shot. 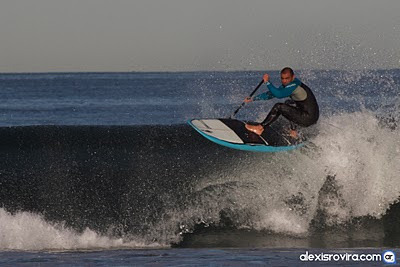 Alexis' caption: Yann Quilfen gets a nice floater down at Green Wall-La Jolla Shores. Super humble guy who is fun to watch, you never know what he's gonna pull out of his bag of tricks. What a killer shot- Alexis tells me that there's more where that came from- can't wait to see 'em and post 'em up. Good job! Great Pic!-would love to see some video of this guy!